Ok, I am going to be a total geek here! Doing a Happy Dance!! 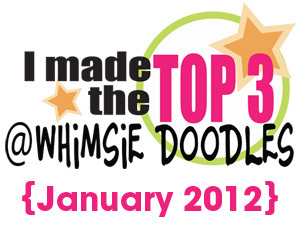 My cards were picked as TOP 3 cards for the January "New" challenge at Whimsie Doodles! AND!! even better I was picked to be the Guest Artist for March at Whimsie Doodles!!! Well done to you and I'm sure you'll enjoy it and make some beautiful things. Woohoo, can't wait for you to join us! !